The Land and Water Conservation Fund Act was enacted by Congress in 1964 "to strengthen the health and vitality of the citizens of the United States" through planning, acquisition, and development of land and water outdoor recreation facilities. A trust fund was created to collect receipts from several sources (chiefly from outer continental shelf oil leases) from which Congress would annually appropriate funds to be distributed among the states and territories. To learn more about the history and accomplishments of this program, see the National Park Service website. To be eligible for funding, each state must prepare a statewide comprehensive outdoor recreation plan (SCORP) that identifies recreation issues of statewide importance and the actions the state will take to address them. These plans must be updated every five years. Minnesota's current SCORP covers the period 2014-2018. Congress intended this investment of public funds to be permanent. Section 6(f) of the Act requires all funded lands to be retained and used solely for outdoor recreation in perpetuity. Any conversion of these lands to uses other than outdoor recreation must be approved by the National Park Service. The Park Service will only consider approval if all alternatives to the conversion have been evaluated and rejected on a sound basis. If approved, the state must acquire replacement lands of at least equal fair market value and recreational usefulness. 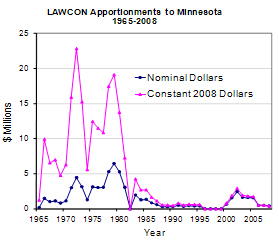 From 1965 to 2014, Minnesota has received $74 million from the Land & Water Conservation Fund. Each grant dollar is matched by an equal amount of state or local funding -- effectively doubling the size of the federal investment. The chart shows the largest apportionments came in the 1970's and early 1980's. Minnesota allocates one half of each annual apportionment to state agencies for statewide facilities including state parks, historical interpretive sites, state trails, wildlife management areas, and water access sites. Most of these state grants have been used by the MN Department of Natural Resources though some have also been used by the MN Historical Society, the University of Minnesota, and the MN Department of Transportation. The other half of each apportionment is used to supplement state funding for the Outdoor Recreation Grant Program. These local government grants have been awarded to counties, cities, and townships throughout the state. For a list of the funded sites, see the Grant-funded Parks . This list includes not only sites funded by LAWCON but also those that received state recreation grants to local governments. Every LAWCON grant recipient agrees to several requirements set by the National Park Service, the federal agency responsible for administering the grant program. The chief requirements are to post a funding acknowledgment sign at the park entrance, maintain and operate the facility to be safe and to invite public use, and to retain the lands solely for outdoor recreation in perpetuity. These requirements are set forth in the Land & Water Conservation Fund Act of 1965 and implemented by the National Park Service' State Assistance Program Manual. The retention requirement is the cornerstone of the Land and Water Conservation Fund Act. Congress intended this investment of public funds to be permanent. Section 6(f) of the Act requires all funded lands to be retained and used solely for outdoor recreation in perpetuity. Any conversion of these lands to uses other than outdoor recreation must be approved by the National Park Service (NPS). The Park Service will only consider approval if all alternatives to the conversion have been evaluated and rejected on a sound basis. If approved, the grant recipient must acquire replacement lands of at least equal fair market value and recreational usefulness. The process of submitting a conversion request is outlined below in Conversion requirement for grant-funded parks . Minnesota has adopted the LAWCON grant guidelines for the administration of recreation grants to local governments whether they are funded solely by LAWCON or have received some combination of LAWCON and state funds. The Department of Natural Resources, Division of Parks and Trails, is responsible for overseeing the program and is the main liaison between the state and the National Park Service. Grant personnel from the division conduct post-completion inspections of each LAWCON-funded site every five years to ensure the terms of the grant agreements are being followed. Any changes to assisted sites must be approved in advance. Please contact the Grants Manager for your area with any questions or concerns.